This is an amazing destination resort accommodation you won't want to miss! Top floor with vaulted ceilings, corner location, a larger living room than most Village 2 bedrooms, flat screens and DVD players in every room, internet access and an iPod sound system with docking station, close proximity to the Gondola (ideal quick access to the mountain), a view of the Ice Rink from the master bedroom and a balcony that overlooks the Gondola. 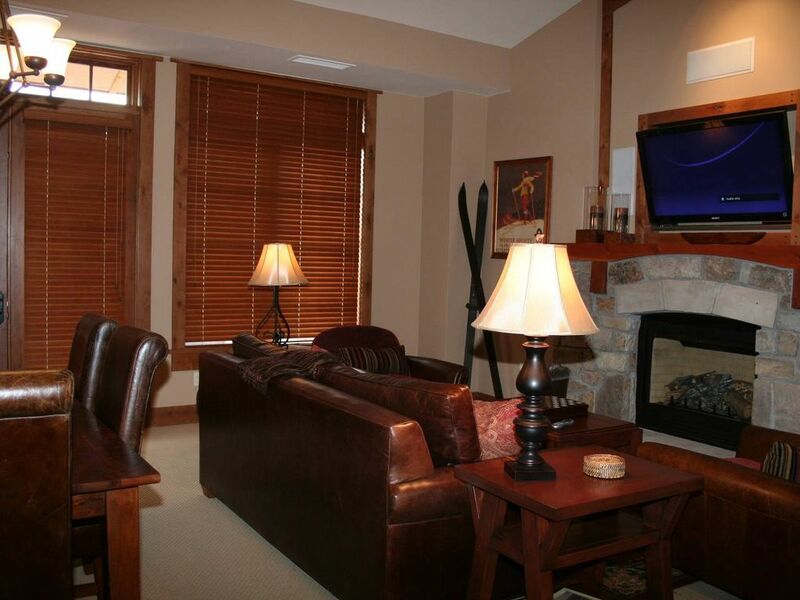 This true ski-in ski-out condo is a dream come true in the winter. Unload all of your gear in the heated underground parking garage, complete with complimentary luggage carts for easy hauling upstairs to the ski locker and the condo. Eat a leisurely breakfast in the morning and still be on the Gondola when it opens, as it is steps away from the Big Horn building. After a vigorous day on the mountain, drop your skis off in the Big Horn ski locker room – just steps from the hill -and head upstairs to relax and reminisce about a great day in the snow. Or go to the ice rink to meet friends for a cocktail and s’mores at the communal fire pits, while listening to live music and watching the kids ice skate, bungee jump, or just play in the snow. In the summer, it is just as wonderful to be at Northstar. Some of Tahoe’s best hiking and mountain biking is right outside the door. Hop on the gondola to access well-maintained trails at mid-mountain or to skip the uphill climb and take a great downhill on the mountain’s various jumps and parks designed for just having fun. Rent a GPS unit for the day at the Village and take the family on a high tech treasure hunt (geocaching) to collect treasures hidden all over the mountain, or watch a movie after sundown on outdoor movie nights every Thursday through Sunday nights. The Village boasts three brand new workout facilities and a resort pool with lanes for swimming laps. World-class golf at Old Greenwood in Truckee (featured in the May issue of Marin Magazine) or the Northstar Association golf course is minutes away, as is miniature golf along the Lake. Northstar Resort Stables also offers horseback riding for the whole family. Add to this everything else that North Lake Tahoe has to offer, and the possibilities are endless. Winter or summer, there are so many dining and entertainment options, it gets difficult to choose what to do first. Grab breakfast, lunch, and/or dinner at one of the many restaurants located right in the Village - Rubicon Pizza, Mikuni Sushi, Olivier Napa Valley Wine Bar, Big Wave Burritos, Earthly Delights Café, Starbucks Coffee, The Chocolate Bar for cocktails, small plates, and amazing desserts, Baxter's Bistro & Lounge featuring upscale dining and live jazz music, among other kiosks for quick snacks. Or bring your own food and dine-in to save time for beading and candle-making with the kids, trampoline bungee jumping year-round, ice-skating and roller skating on the centrally located Village rink, an Apex ropes course in the summer and snow-tubing in the winter. Treat yourself and your family to a vacation you'll never forget. Super convenient for ski families: once you park you won’t need your car again until you check out! It was very clean, cozy and rustic feeling. It was overall very nice. The trash situation and the slow elevators need attention. The perfect place to stay in The Village at North Star! Amazing property. Comfortable beds with luxury bedding. Perfect location and well stocked for all your needs. We will definitely be back!